American Lynne Cox swam from the North Island to the South in 12 hours 7 minutes. The fourth person to do so, she battled heavy seas and strong winds. Twice the Cook Strait cargo ferry Aratika hove to alongside her to provide protection. 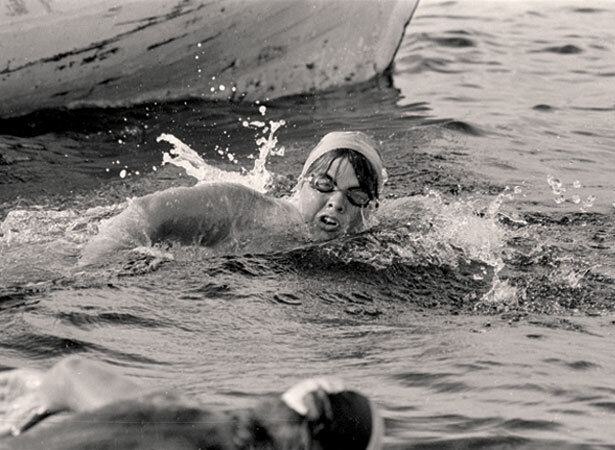 Cox went on to swim in the sub-Arctic Bering Strait and in Antarctic waters. The 22.5-km Cook Strait crossing involves chilly water, treacherous tides and often-rough weather. R.G. Webster and Lily Copplestone made the first attempts in 1929. The first to succeed was Barrie Devenport on 20 November 1962. Philip Rush made the first non-stop double crossing on 13 March 1984. Casey Glover swam the strait from north to south on 13 April 2008 in a record 4 hours 37 minutes. Eleven-year-old Aditya Raut became the youngest conqueror of Cook Strait on 20 February 2005. The oldest is Toshio Ogawa, who was 60 when he succeeded on 3 March 2015. By February 2017, 90 people had made 100 successful crossings. Rush has swum the strait six times and Meda McKenzie four times. We have 11 biographies, 7 articles, related to First woman swims Cook Strait.